I always have a few patterns lying on top of the chest of drawers, for inspiration; these are projects I’m hoping to tackle soon, or at least don’t want to forget about ;). 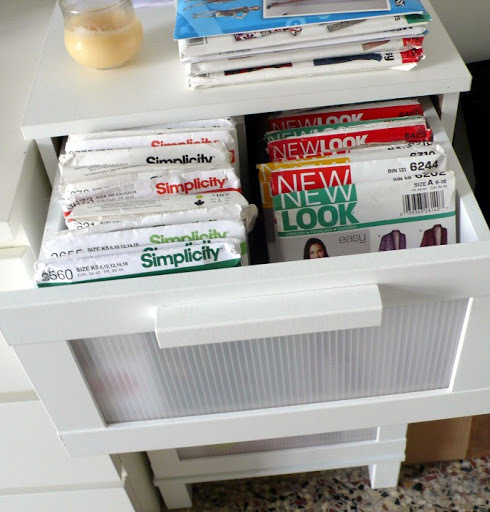 In the top drawer are my Simplicity (left) and New Look (right) patterns. As in the whole chest, everything is sorted by number, in ascending order. On the left stand the smaller Vogue envelopes, with my (very few) Buttericks behind them; on the right lie the larger Vogue envelopes, with two or three craft patterns (hats, aprons) in the small space that’s left behind them. Tucked at the front, you can see my patterns from Onion and one from Amy Butler; on the left are my Hot Patterns, a couple of very recent Jalie patterns, and visible on top of the pile, one (also very recent) Folkwear pattern that I had to get after seeing Sharon’s lovely empire dress. On the right are my McCalls and vintage patterns. The size of the Hot Patterns envelopes don’t allow these smaller patterns to stand full-front as in the higher drawers, so these are lying sideways. 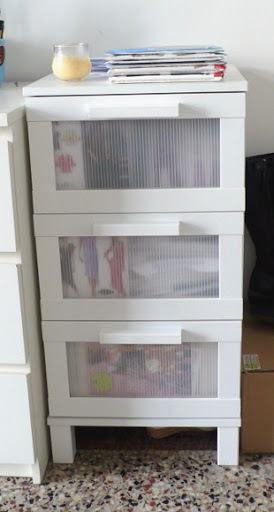 I love the fact that the fronts of the drawers are transparent: being able to peek at what’s nestling in there always makes me smile. Don't wish for the bigger size. I have seen several bigger sized Aneboda used as pattern storage on blogs where the bottom has fallen out. We have the bogger size as well for clothes and it can't hold very much and the metal things it runs on is very weak. Buy one more of the smaller ones instead. I like how your cabinet can hold 2 rows of patterns in each drawer. I keep my patterns in desk drawers but they have to be on their side to fit. Your filing system is much neater and more organized. I love seeing how people stay organized. It's a never-ending battle for me. What a lovely system of organizing. Pratical, yet very pretty at the same time. My eye immediately went to that Empire Dress pattern! I have the “Armistace Blouse (1981 style) from that same company. hmmm I knew I couldn't fit the bit one but the smaller one may be in the cards. Thanks for the inspiration! Hi dear friend! 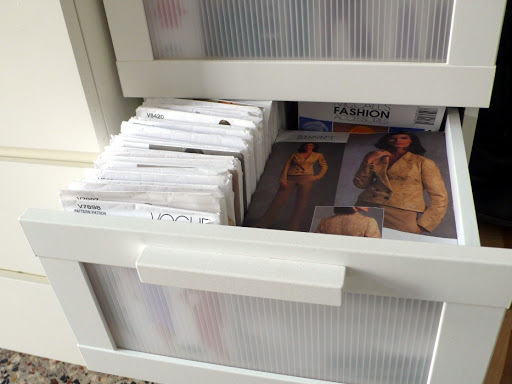 You have a great organizing system; my patterns are stored in card boxes for now… I need to by a drawer cabinet for them too! Great way of organizing. 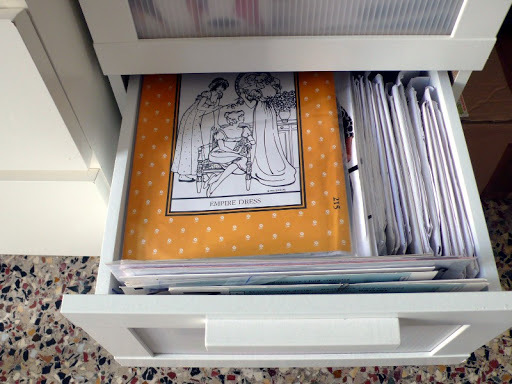 Like Tini I wish I was organized like that, won't be (even when I would buy such a nice drawer set). Wow you are so organised! Hello my dear friend ! Super! On dirait que le meuble a été créé pour cela. J'aime l'idée des tiroirs transparents. Bonne journée! Et bien dis donc, y'a de la matière et le meuble à tiroirs s'imposait! J'avoue que je n'en ai pas autant et j'attends la pose d'étagères pour mieux ranger les miens.